Hangzhou attracts emerging pharmaceutical companies and draws investment in a rapidly expanding market. The movie “Dying to Survive” became an unexpected blockbuster, with the third best-selling movie of 2018 achieving a box office return of nearly 3.1 billion yuan (US$450.9 million). The movie sheds light on cancer patients in China who face the dilemma of either taking expensive imported anti-tumor drugs or buying smuggled generic drugs. The generic drugs are the much cheaper “copies” of the patented original drugs and are usually allowed to be sold after the patent expires. An investment report released by UBS shows that in 2016 China was the third largest market for generic drugs. By next year the market size is expected to reach a value of US$42 billion, just after the United States. At present, around 95 percent of registered drugs produced in China are generics, according to Qianzhan Industry Research Institute. “The pharmaceutical industry is highly dependent on policies. We have two major tasks facing us. One is to improve the quality of our generics, the other being the development of more original drugs, especially those related to cancer treatment,” said Shao Yuanchang, deputy director of Zhejiang Medical Products Administration. In 2012, the State Council’s 12th Five-Year Plan (2011-15) said that registered generic drugs needed to be evaluated for quality and efficacy. Those that failed the test shall not be allowed to be sold. A further announcement in 2015 stipulated a work plan for the policy and the evaluation work was officially launched in 2016 by the then China Food and Drug Administration, now the National Medical Products Administration. Zhejiang companies were among the first to receive approvals from the CFDA. To date, 24 types/specifications of generic drugs produced in Zhejiang have passed the tests, leading all other provinces. Local governments have pushed forward incentives. The provincial government awards the first three companies passing the test 3 million yuan for each drug type/specification. Others may receive 1 million yuan from the municipal government. Relevant regulations also follow to ensure that local hospitals have access to qualified drugs via the official online procurement platform. At the same time, companies with the capacity to develop original drugs are emerging. Betta Pharmaceuticals, a listed company founded by several PhD graduates who have returned from the US, produced and developed China’s first home-grown anti-cancer targeted drug. The medicine received a patent in 2007 and was launched to the market as Conmana in 2011. It has an approved efficacy to treat patients with non-small cell lung cancer, many of whom have not responded to traditional chemotherapy. “From the design of the chemical compound in a US lab in 2002, to applying for a clinical trial in 2005 and to the final launch event in August 2011, the process took us 10 years,” said Ma Yongbin, Betta’s vice president. The research and development of patented drugs has a high risk of failure and needs a large and stable supply of funds from beginning to end. “By the time the drug got merchandised, the company had more than 100 million yuan of deficit in the bank account,” said Ma. Since 2015, Conmana has led in the Chinese market with cumulative sales reaching 5.5 billion yuan, benefiting more than 180,000 lung cancer patients. It has also helped reduce the cost of treatment for each patient. In 2011, when imported drugs still monopolized the market, the monthly cost for one patient was between 16,000 yuan and 20,000 yuan. In comparison, the monthly cost of taking Conmana was 11,800 yuan. In 2017, after a price negotiation with the Ministry of Human Resources and Social Securities, Conmana was listed in the national health insurance drug catalogue. The expenditure per month for treatment has been cut to around 5,700 yuan, 80 percent of which can be covered by medical insurance. Ma said the company has over 30 new projects in different stages of research and development. The success of Betta has encouraged others and attracted venture capital. Just Biotherapeutics is located in the core “Biopharma Town” of Hangzhou Economic and Technological Development Area. Since its establishment in 2016, the company has secured over US$120 million from investment companies including Temasek, Lilly Asia Ventures and Taikong Group. Its Hangzhou R&D center and manufacturing facility went into operation in January 2018, and a new clinical development center opened in Boston, in the US, two months later. Globally, nearly 100 scientists and engineers work for the company. “One of the main reasons that the company was established is that we hope to reduce the cost of biologic medicines, and increase their availability to more patients,” said Kevin Zhuge, senior director for engineering at the Hangzhou center. 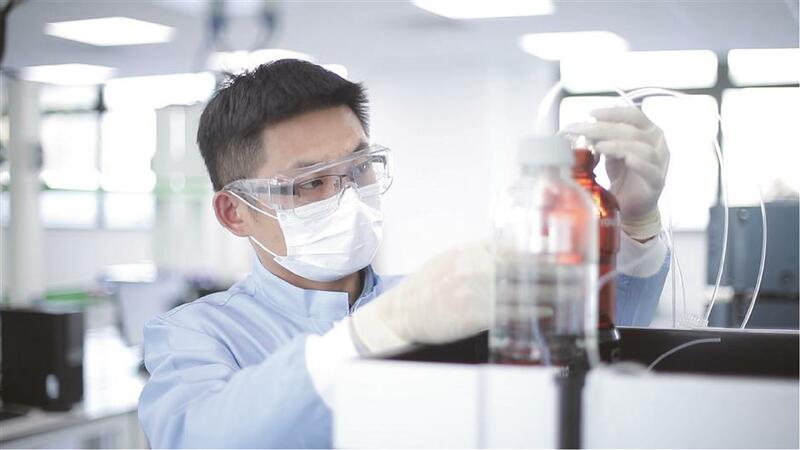 By enabling a third-generation biologics production platform with disposable technologies and intensified processes, the Hangzhou center is able to lower the manufacturing cost of antibody drugs by 30 percent. “For example, big biopharmaceutical companies may price their monoclonal antibodies between US$200 to US$300 per gram. Top companies such as Amgen can reduce it to US$180. We can keep it at around US$100 now,” Zhuge said. Monoclonal antibody therapy has a very good prospect for treatment in areas of cancer and autoimmune diseases. “Our goal is to bring down the price to US$10 per gram in the next 10 years,” said Zhuge. 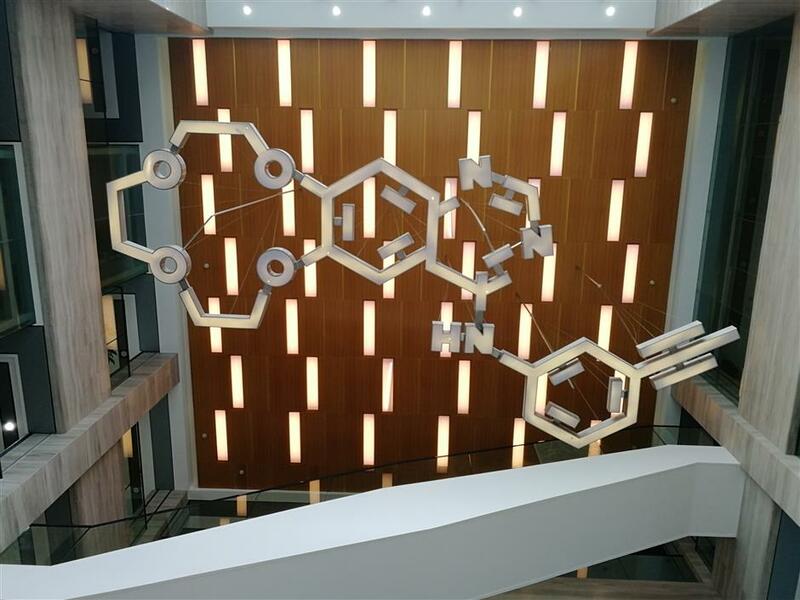 The structural formula of Conmana on display in the R&D center of Hangzhou Betta Pharmaceuticals. Conmana is the first patented drug developed by a Chinese company for the treatment of non-small cell lung cancer. By the end of 2017 there were over 450 biopharmaceutical companies in the economic zone, which accounts for 50 percent of the city’s gross biopharma industrial value. In 2018, 245 new companies were set up in the area, rising by 44.3 percent from a year earlier. “I think the Hangzhou government is very supportive of startups like us, both in its policies and in its services,” said Chen Yan, co-founder and COO of Lynk Pharmaceuticals which specializes in the research and development of patented drugs for cancer and immune system diseases. The company just started operations in early 2018 and has already received more than 1 million yuan in startup funds from the economic zone. “Our program has been graded A-level in a preliminary evaluation. Now we are applying for a formal review of all entrepreneurial programs, where the top programs may receive a subsidy up to 10 million yuan,” Chen added.